White pearl finish Tila beads mix with ebony twin hole beads and seed beads to create the beautiful clean lines of this diamond shaped pendant. Versatile enough to wear with any color or fashion. Although I chose to add this project to a chain to wear as a necklace, you could make two pieces and dangle them from earring wires... if you like earrings that make a bold statement. At 1.25”, they certainly would! The red arrows in the steps indicate the direction of the thread. The hand-drawn red lines represent the thread. step 1 - Cut a piece of 36” beading thread. Add a stop bead 12” from the end. Work the needle through four pairs of tila beads with a black seed bead, a black oval bead, and another black seed bead between each pair. step 2 - Bring the needle back to the starting point and work your way back through same holes. step 3 - Pull the tail threads toward each other which will roughly form a square shape. step 4 - Pass the needle through the outside holes of the tila beads. Add a black seed bead, and a silver seed bead. Bring the needle through the top hole of the oval bead then add a silver bead and black bead. Pass through the next two tila beads. step 6 - Begin a new row by adding another tila bead to the thread. step 7 - To secure the tila beads to each other, return the thread back through the tila bead in the first row then back through the tila bead in the second row. step 8 - Add another tila bead to form a pair. Secure the bead as you did in step 7 by bringing the thread through the matching tila bead in the first row and coming back through the new bead to secure it. step 9 - Add a black seed bead, two silver beads and add an oval bead. Add two silver beads and a black bead then pass through the next tila bead. Secure the tila bead as in step 7. Work around the pendant adding corner beads and securing tila beads. step 10 - Move your thread through the outside holes of two tila beads. 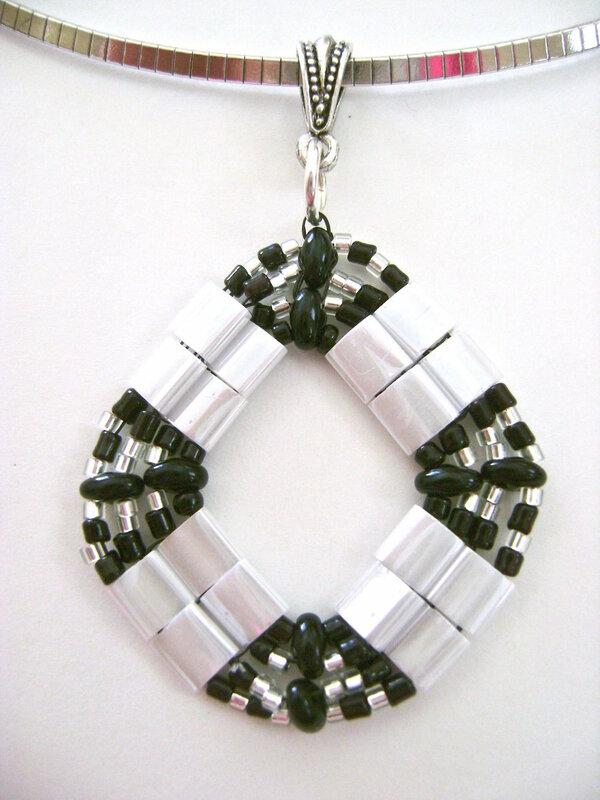 Add A black seed bead, a silver bead, another black bead, and a silver bead. Pass through the top hole of the oval bead and add the same four beads only in reverse order. Pass through the next two tila beads. Continue working around the pendant in this way. step 11 - When you return to your starting point, bring the needle through the next four seed beads then through the top hole of the oval bead. Weave the needle in and out of the holes in the oval beads securing them to each other. Reverse the process returning to the top hole. step 12 - Attach a jump ring to the pendant by passing the needle through it three times. Move back through the top hole of the oval bead. Work the thread in and out of several beads tying half hitch knots in between to keep the work from unraveling. step 13 - Remove the stop bead from the beginning thread and work it through beads adding half hitch knots. Trim excess from both threads. step 14 - Attach a bail to the jump ring. Be sure the ring is closed tight so the thread connecting it to the pendant doesn’t slip through.